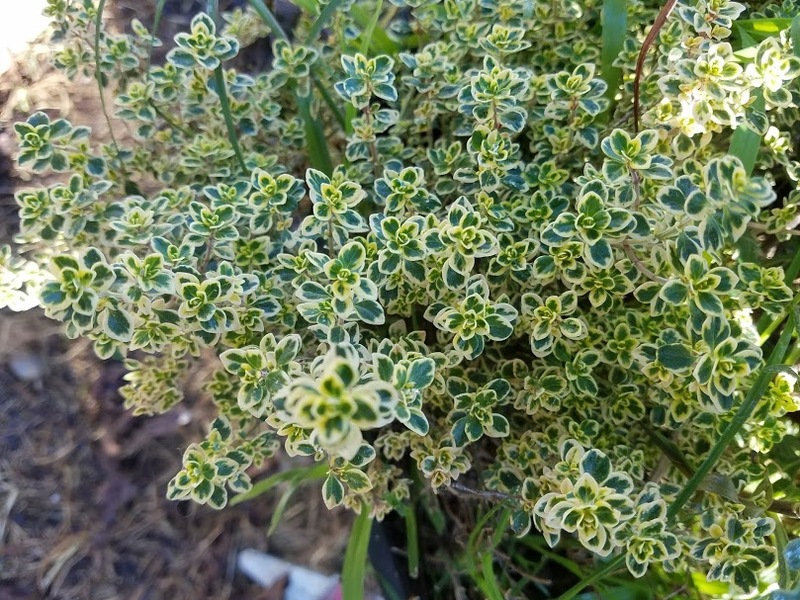 In my herb garden, thyme and oregano become woody in the face of cold. Sometimes, I think they won’t recover, but when intermittent warm days hint at spring to come, the fragrant leaves begin to sprout. Even when the air again chills to icy frosts, they know the future is bright and they thrive. Not all growing things have such a strong internal clock. A string of warm fall days can trigger plum tree blooms. Like tiny pink bows, they peek from between the drying leaves, eager to give. Too eager. 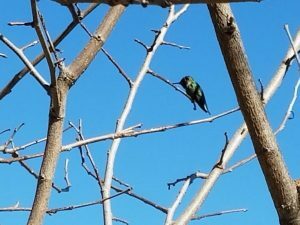 When winter winds blow, they flutter and fall. Energy expended but no fruit produced. Still, the trees have the good sense to rest. In the silent months, separated from their loving sun, the trees grow strong. So, when the timing is right, they are ready. 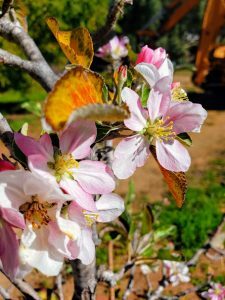 The apple trees, a crabby variety bred for drought, are resilient. Their blooms open in January, cling and remain. By June, they have ripe fruit. Their branches may be drooping, heavy with apples one day and then picked clean by coyotes in the dark of night. Often, the apples start afresh, and the trees bear a second crop, though smaller than the first. 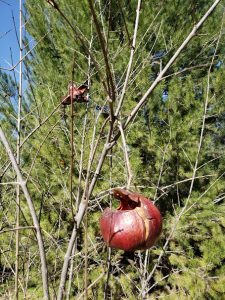 The pomegranate trees are late to lose their leaves. Then their pale gray branches stubbornly resist the sun’s flirtation. A few fruits that are left hanging grow tough through winter but can sustain a wayward bird with an insistent peck. The chaste tea tree is numbed by winter. So much so that as, all around, spring springs and greenery greens, the barren sticks seem dead. Every year, I am nearly fooled. I snap off a twig and find it wick. This makes me laugh. There is life inside. It only needs nurturing. As the years have passed and estrangement endures through its seasons, I have seen myself in all of these. The herbs with their steady inner clocks. The plum trees that are, at times, too eager. The pomegranate trees that grow tough and stubborn but eventually live up to their varietal name (Wonderful). And the chaste tea tree that numbs and deadens. I am wick inside. If only I will not be fooled. Whether you like growing things, just spending time in a garden, or even looking at plant catalogs, can you parallel your growth or endurance in estrangement with that of plants and trees? Seeing ourselves reflected in a garden’s growth can be a healing. Can you imagine yourself recovering from the cold of a stressful season by stretching toward the sunlight? As you add water and special food, imagine treating yourself to loving care. Can you see yourself blooming? Even if you feel numb, as if your leaves droop and you thirst for sustenance, can you imagine you are quietly doing the work of resting, like my plum trees do in winter? Are you seeing bulb flowers sprout through the snow? If so, can you imagine yourself pushing up through the muck of a difficult relationship or the icy cold of rejection? Whether you call it horticultural therapy or just call it fun or relaxing, cultivating plants or spending time in gardens has benefits. Reductions in stress, anxiety, and feelings of isolation, as well as enhanced self-esteem are all known positives. If it’s still too snowy to do any outdoor gardening, consider getting started inside. I hear geraniums do well in pots. Or maybe just remembering being outdoors last summer would feel good. Imagine your feet, stepping into a soft carpet of grass, or the sunlight warming your back. As the dead of winter marches toward spring, I would love to hear from you. Please leave a comment to this article about your own garden and how it helps you. I like reading about people’s gardens, and others do too. This entry was posted in Latest Posts, What Parents Can Do and tagged estrangement, son doesn't like me on January 29, 2019 by rparents.